Nowadays foods are not purposed to only accept hunger and to give vital nutrients for humans, but also to protect and treated nutrition-related diseases and ameliorate physical and mental status of the consumers. In this respect, probiotic play a prominent role. Thence this study aimed to estimate the chemical constituents of kefir and kefir grain and identify the potential protective effect of probiotic (yoghurt/ kefir milk / kefir grain) to diminish the risk of lead (Pb) intoxication on male rats. 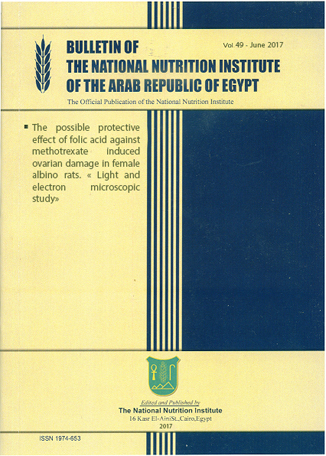 Biological study was administered on forty two male rats which allotted into 6 groups involved negative control group (7 rats) , normal group consumed kefir milk and four groups which treated 50 mg of lead/kg body weight per day as testicular toxicant and classified into positive control group (+ve) , subgroups : yoghurt, kefir milk and kefir grain subgroups. The results revealed that all experimental treatments enhanced liver and kidney functions , antioxidant parameters and testosterone hormone levels, luteinizing hormone (LH) and follicle stimulating hormone level (FSH) the most prominent positive effects were perceived in the group that consumed kefir milk and kefir grain. These acquired results are assured by the histopathological examination. In the present study, the protective effect of kefir milk and kefir grain against lead toxicity in rats was become well. Therefore, this study recommends that consume kefir and supplemented the products with kefir grains to prevent the damage caused by lead contamination.